Thomas Friedman has it right at the New York Times in his opinion piece on Brexit: The United Kingdom Has Gone Mad. The subtitle tells it all: "The problem with holding out for a perfect Brexit plan is that you can’t fix stupid." Sad but true. See Brexit Is Messy. London’s Lawyers Are Cashing In. by David Segal at the New York Times. Europe is making it tougher for the online use of copyrighted materials by tech companies. Abydos Boats and Enclosures Mark the Stars of Cepheus, One of the Argonauts Immortalized in the Stars: Are These The Boats of Jason and his Minyans? 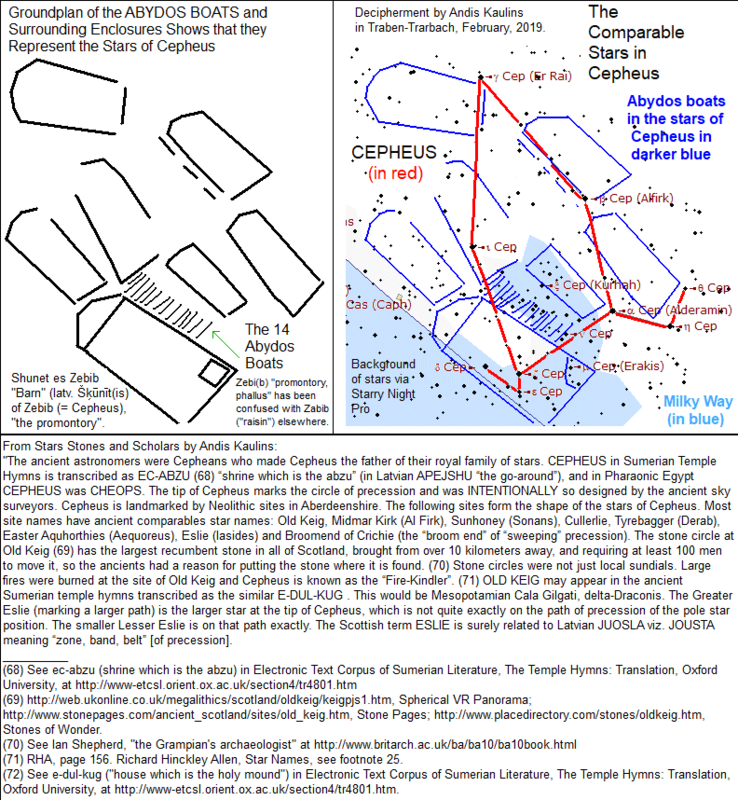 we showed that the Abydos Boats are "docked" at the "harbor" of Cepheus, which is marked in a figure at the Dolmen viz. Tumulus of Mane Lud Locmariaquer in Morbihan, France. See our previous posting on The Dolmen viz. Tumulus of Mane Lud viz. Mané Lud Locmariaquer Morbihan France Deciphered as Marking the Stars of the Vernal Equinox ca. 4320 BC. The following graphic arguably shows why those boats were docked at Cepheus in ca. 3360 BC, being at a central astronomical location in the era of 3360 BC, not just in terms of the Milky Way, but also with regard to the North Galactic Pole, the North Ecliptic Pole, the North Celestial Pole, and the Winter Solstice, all of which are located on a line that sets off the Cepheus harbor. We thus consider the era of 3360 BC to be a likely date for the real voyage of the legendary Jason and the Argonauts, coinciding with the start of protodynastic Egypt. This may relate to the influx of "Gerzeh Culture" into Egypt. As written in the Wikipedia: "Some symbols on Gerzeh pottery resemble traditional Egyptian hieroglyphs, which were contemporaneous with the proto-cuneiform script of Sumer." Please click on the graphic below to obtain a larger, more readable image. The general topic of ancient seafarers also has to do with significant changes in the European genetic picture, which changed dramatically ca. 4500 B.C., about the same time that we claim that the megalithic calendar was instituted in 4320 BC. See Ker Than, Modern Europe's Genetic History Starts in Stone Age, National Geographic News, in which the sub-headline is that "Scientists create the first detailed genetic history of modern Europe". "DNA recovered from ancient skeletons reveals that the genetic makeup of modern Europe was established around 4,500 B.C. in the mid-Neolithic...."
Given the content of our immediately previous postings we are now in a position to present our decipherment of the Dolmen viz. Tumulus of Mane Lud viz. 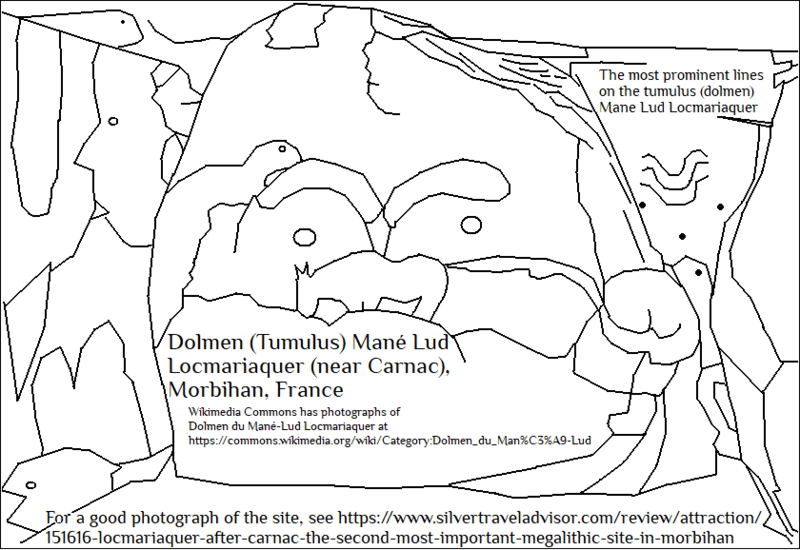 Mané Lud Locmariaquer of Morbihan, France, which is located on the highest point of Locmariaquer, a port at the entrance to the Gulf of Morbihan, a natural harbor, surely used by the ancients who erected the megalithic sites in the area. We have deciphered that the various markings found on the Dolmen viz. Tumulus Mané Lud viz. Mane Lud Locmariaquer represent stars at or near the Vernal Equinox in ca. 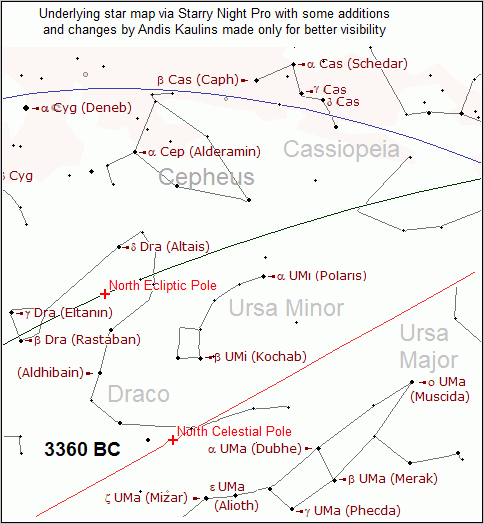 4320 BC between the stars of Gemini and Auriga, and that the specific figure marked on the dolmen that many have thought to be "boats" in fact ARE boats, and, indeed, our decipherment shows that they are docked above Cassiopeia in the harbor of Cepheus in the stars, as that harbor has been previously identified regarding the Abydos Boats. It is a nice confirmation of our previous analysis of this whole subject matter. 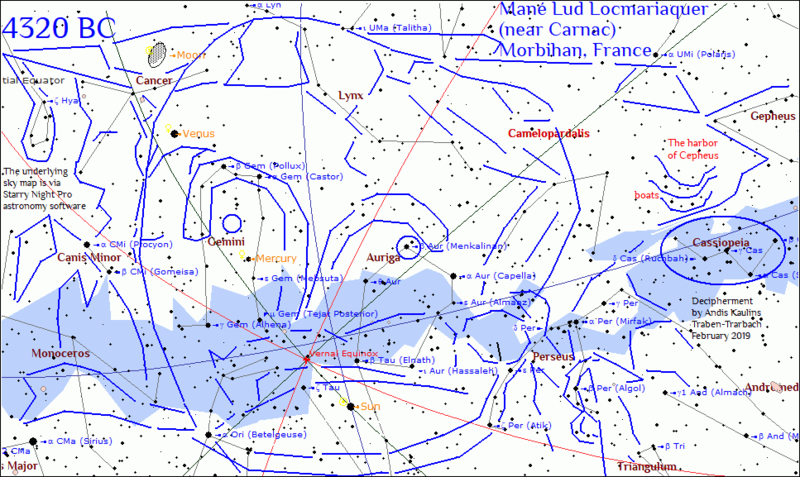 We can say, however, that Mané Lud does not have the figure of a spouting whale marked on it, but rather that figure represents a "tree of life"-type figure (Germanic Irminsul) seen by the ancients between the stars of Gemini and Auriga, due to its shape as the mammalian female reproductive organ, but not so recognized by modern scholars. Just enter the keywords "female reproductive organ whale" into Google and you can then locate the comparable image. 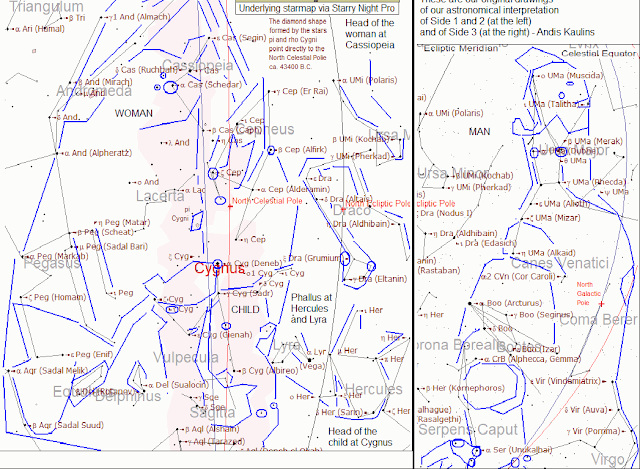 The following graphics show our view of the most prominent lines on the Tumulus of Mané Lud Locmariaquer and our decipherment of those lines as marking stars at and near the Vernal Equinox in ca. 4320 BC. Many things authenticate this decipherment. Just look at the hair, tied in a bun at the side, and the many unusual small details carved on stone that match similar unusual groups of shapes in the actual stars. For example, loook at the forehead of the figure. here at the Hotel Celtique, located between the two. I thought I had deciphered some of the Carnac megaliths at that time, finding that the front row of stones seemed to measure stars along the Galactic Equator. Apparently, the ancients were dealing with the starry consequences of precession. 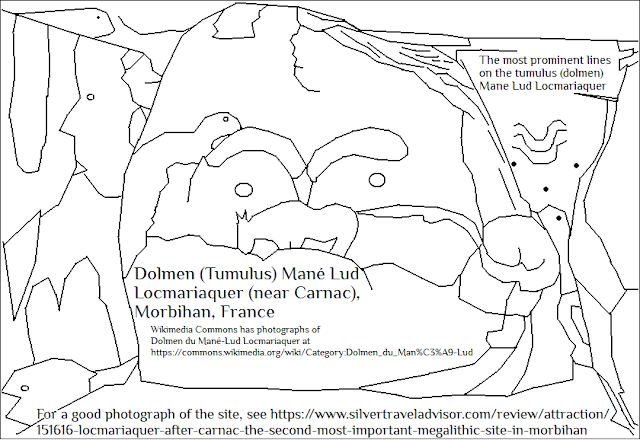 However, I have not been back to Carnac or Locmariaquer since then. One can not do everything, and I am happy to have been there once. In 4320 BC, the Autumn Equinox in the stars was located "at" (modernly "near") the Galactic Center of our Galaxy near Alnasl, gamma2 Sagittarii, or, alternatively, 3 Sagittarii), with the arrowhead of the arrow of the bow of Sagittarius pointing to that galactic center. 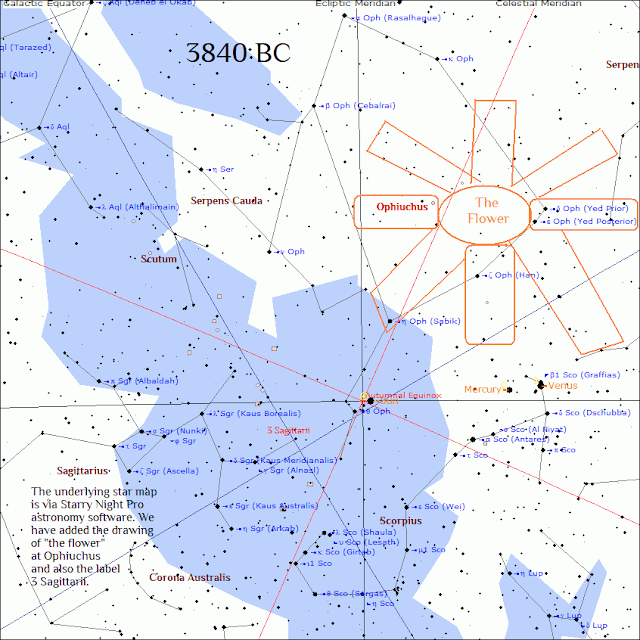 Modernly, the spout of the "teapot" asterism of Sagittarius points in that same galaxy-centered direction. 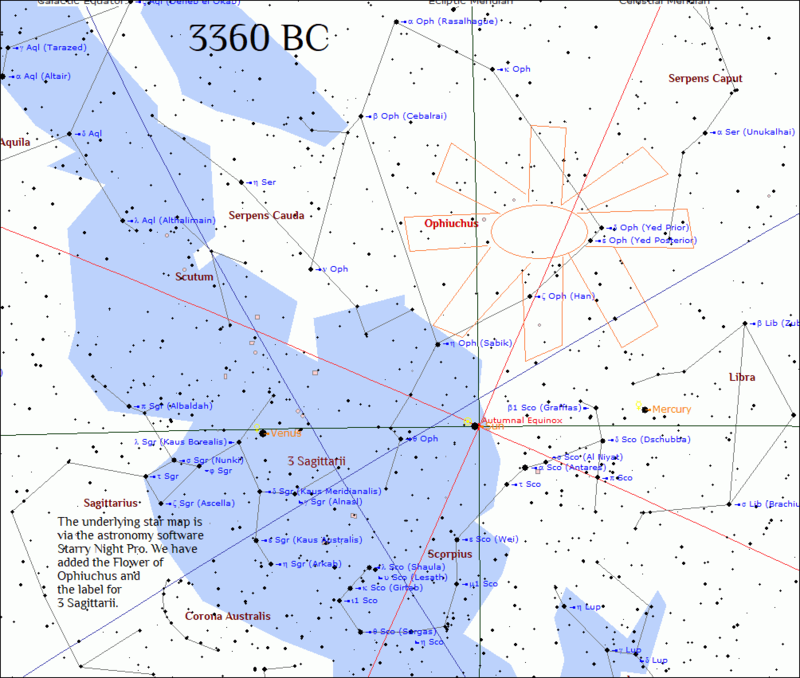 Such a central Autumn Equinox location in the stars would surely appear to be a likely reason for the presumed choice of the date 4320 BC as a calendric landmark by the ancients. 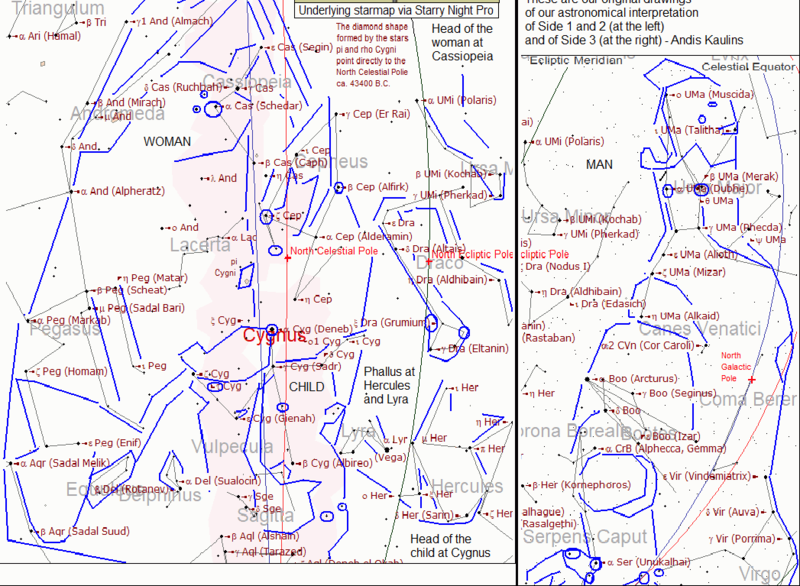 Some of our still "modern" constellations of the Zodiac may have been "drawn" then, for the arrow of Sagittarius points to the Galactic Center, and was surely so intended by the ancient constellation makers, with the arrowhead placed at gamma-2 Sagittarii by historical tradition although 3 Sagittarii might be a better and closer candidate for the original placement. We would then expect the following major calendar reform dates somewhere in the C14 record, idealized to conform to 240, 480, 960, and 1440-year intervals, with 240-year intervals also in evidence e.g. 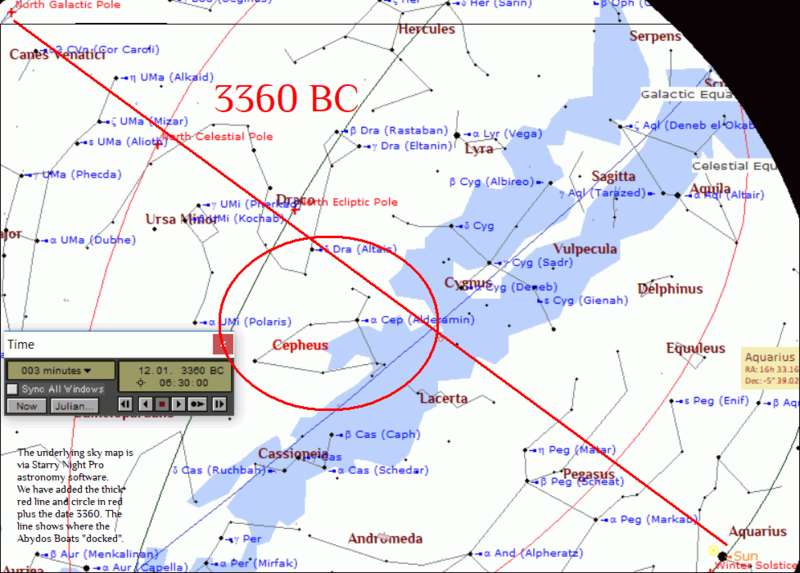 at the (by us) presumed 3117 BC start of the dynastic Pharaonic Egyptian Calendar and the ca. 237 BC Restoration of the Etruscan Secular Games, an interval of 2880 years. 4320 BC - 3840 BC - 3360 BC - 2880 BC etc. Please click on the graphic below for a larger image. this date conforms to the Hebrew Calender, which is said to start on 3760 BC, but at "the Creation" it is said that "80 years is a day" -- a one-day error there ? -- so that 3840 BC is possible. the hieroglyphs in the serekh of Khasekhemy's name show two downward arrows as arguably signs for the Equinox-balanced Autumn Equinox, with the Falcon and Seth, as Ursa Minor and Ursa Major, Latvian siet-iņš, "the sieve", erroneously identified in Milenbachs-Endzelins as a different group of seven stars, sitting above the rectangle of the serekh, where the latter two in this era face each other across the Celestial Meridian. It is at ca. 2400 BC that we find use of the Temples of Malta to come to an end. See Caroline Malone, Nathaniel Cutajar, T. Rowan McLaughlin, Bernardette Mercieca-Spiteri, Anthony Pace, Ronika K. Power, Simon Stoddart, Sharon Sultana, Christopher Bronk Ramsey, Elaine Dunbar, Alex Bayliss, Frances Healy, Alasdair Whittle, Island questions: the chronology of the Brochtorff Circle at Xagħra, Gozo, and its significance for the Neolithic sequence on Malta, Archaeol Anthropol Sci [Archaeological and Anthropological Sciences pp 1–56] (2019). https://doi.org/10.1007/s12520-019-00790-y, first online 20 February 2019. Are we "current"? Ja, ja, ja. 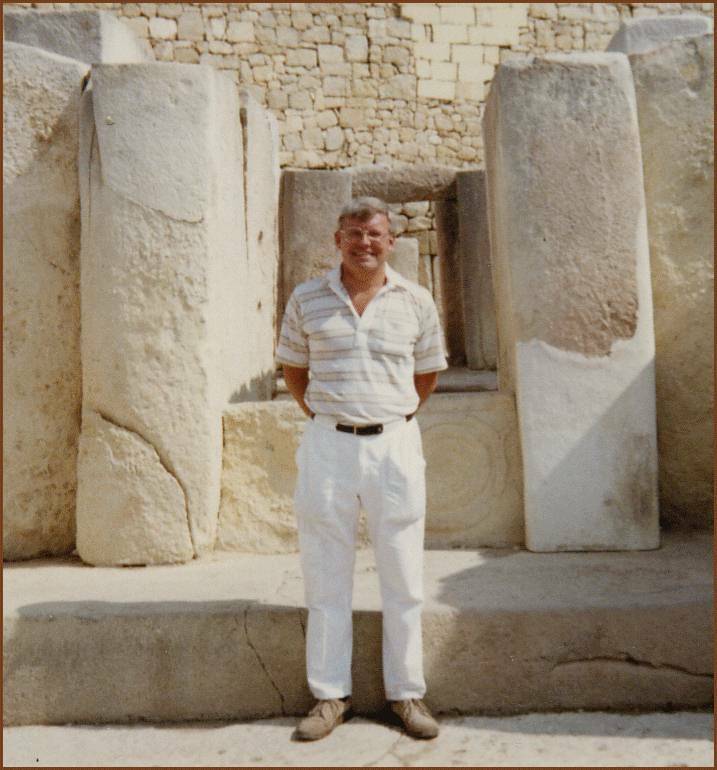 Above is a photograph of the present author, Andis Kaulins, at the Temples of Malta, here at the famed Temple of Tarxien in 1986, at age 40, a photo on the back cover of my book, Ancient Signs, The Alphabet & the Origins of Writing, as published at www.epubli.de, ISBN 9783844220179. Way back when, 32 years ago, I saw that these temples were astronomical in orientation and nature. Verily. The gap between the upper and lower values of these dates is so large that there is no point in taking averages. Obviously, "apples and oranges" have been mixed in the data. The maximum outer dates are the relatively correct ones. Conclusion. Please take it for what it is worth. For any given academic problem or mystery, there are always various possible solutions that must be examined, nothing wrong with that. However, for best results, one cannot permit preconcpetions and "school of thought" paradigms to automatically limit the scope of examination or research. In the case of Archaeology, especially as regards the study of the prehistoric and ancient past, ancient astronomy must be included in the scope of possible explanations for the data and evidence at hand. Otherwise, scientists are just simply wasting their time, and will never get closer to the truth of human history. You have to be on the right road to get there. gave men their first conceptions of natural law." "For thousands of years, prehistoric societies built monumental grave architecture and erected standing stones in the coastal regions of Europe (4500–2500 calibrated years BC). Our understanding of the rise of these megalithic societies is contentious and patchy; the origin for the emergence of megalithic architecture in various regions has been controversial and debated for over 100 y. The result presented here, based on analyses of 2,410 radiocarbon dates and highly precise chronologies for megalithic sites and related contexts, suggests maritime mobility and intercultural exchange. We argue for the transfer of the megalithic concept over sea routes emanating from northwest France, and for advanced maritime technology and seafaring in the megalithic Age. There are two competing hypotheses for the origin of megaliths in Europe. The conventional view from the late 19th and early 20th centuries was of a single-source diffusion of megaliths in Europe from the Near East through the Mediterranean and along the Atlantic coast. Following early radiocarbon dating in the 1970s, an alternative hypothesis arose of regional independent developments in Europe. This model has dominated megalith research until today. We applied a Bayesian statistical approach to 2,410 currently available radiocarbon results from megalithic, partly premegalithic, and contemporaneous nonmegalithic contexts in Europe to resolve this long-standing debate. The radiocarbon results suggest that megalithic graves emerged within a brief time interval of 200 y to 300 y in the second half of the fifth millennium calibrated years BC in northwest France, the Mediterranean, and the Atlantic coast of Iberia. We found decisive support for the spread of megaliths along the sea route in three main phases. Thus, a maritime diffusion model is the most likely explanation of their expansion." Paulsson's article was reported in the New York Times on February 11, 2019 by James Gorman in Ancient European Stone Monuments Said to Originate in Northwest France. It took us a few weeks to pen an appropriate review of the article, which began with our previous posting on the Abydos Boats, by our prelude to this posting in our previous posting, and will be followed by other postings and decipherments that have been long slumbering on our hard disk, awaiting the right moment, which now appears to have arrived. The reader might find it useful to read the postings in their relation to the present material. We are pleased that Paulsson has spent so much time and effort researching megalithic sites, so that articles such as hers are to be encouraged, especially since they deal with seminal questions of the chronological dating of megalithic era construction. Regrettably, mainstream Archaeology and its related disciplines generally deal with megalithic evidentiary data in a very subjective way, usually one that fits prevailing schools of thought -- weak paradigms that we have found in our 40-year-long megalithic research to be largely false or misleading. We are not against Paulsson's main conclusions in principle, but so-called "highly precise chronologies" in Archaeology have for decades left too much leeway ("wiggle room"), so that claims of preciseness in mainstream chronologies are suspect. Paulsson's article is an excellent step in the right direction, but much more needs to be done in rolling back the clock and getting a clearer, more accurate picture of the past. Agreement with the basic conclusion that megalithic sites were initially spread by ancient seafarers does not resolve the core issue of ultimate origin, either as to geographic location or as to the purposes of megalithic construction. Such an "original" location for the seafaring-spread of megalithic culture should be verified by in situ ancient boatbuilding and megalithic know-how evidence. The unique Abydos Boats of Ancient Egypt are one example of this, as we think they were buried "royally" to honor the Minyans who went out "to measure" the sky of stars, as related in the Book of Enoch, Chapter 61. LXI. Angels go off to measure Paradise: the Judgement of the Righteous by the Elect One: the Praise of the Elect One and of God. "1. And in those days, I saw long cords given to those Angels and they acquired wings for themselves, and flew, and went towards the north. 3. And the Angel who went with me, said to me: “These will bring the measurements of the righteous, and the ropes of the righteous, to the righteous, that they may rely on the name of the Lord of Spirits for ever and ever." 4. The chosen will begin to dwell with the chosen, and these measurements will be given to faith, and will strengthen righteousness. 5. And these measurements will reveal all the secrets of the depths of the Earth, and those who were destroyed by the desert, and those who were devoured by the fish of the sea, and by animals, that they may return and rely on the Day of the Chosen One. For no one will be destroyed in front of the Lord of Spirits, and no one can be destroyed." We suggest that these were hermetic measurements, "as above, so below", applying the readily visible plan of the stars of heaven to a measured map of the earth, and related to astronomically visible changes in the seasonal position of the stars as caused by Precession of the Equinoxes. Can we tell when such measurements were anciently made? Paulsson's article relies on so-called calibrated radiocarbon dating ("cal BC"), which starts out with the measurement of C14 in biological specimens. Since C14 is created by cosmic radiation and varies from year to year, straight radiocarbon dating of ancient specimens is not "highly precise". Rather, science tries to "calibrate" the C14 radiocarbon data with dendrochronologically (tree-ring) derived more exact "calendar dates". A date that integrates the abbreviation "cal BC" gives the number of calibrated years "before Christ". It is better than straight BC, but not perfect. "As Mary Hudson explained in her Aucilla River Times article two years ago, C14 is created by cosmic radiation in the upper atmosphere. That radiation fluctuates year to year and therefore so does the creation of C14 . That means if [a tree] branch grew at a time when relatively lower levels of C14 were in the atmosphere, it would have less C14 when it died and would show an older apparent age than it should. Conversely, if it grew at a time of abundant C14 it would appear younger than it should. This differential C14 concentration may give [a tree] branch a younger C14 age than another branch that died hundreds of years after our branch, making comparison of the two samples misleading. The only way to resolve this uncertainty is to calibrate the C14 dates with calendar dates. This calibration has been done by compiling a dendrochronological (tree-ring) record and painstakingly figuring the C14 age of these tree rings. This tree-ring record now extends back about 11,500 years, and by comparing the calendar age of the tree rings with their radiocarbon age, calibration curves have been created to produce a calendar date for a corresponding C14 date. The differential production of C14 produces “wiggles” in the calibration curves, and these wiggles can result in a single radiocarbon age corresponding to more than one calendar age. There are thus no really "highly precise chronologies" yet available based on radiocarbon dating. Too much subjective input goes into interpretation of the data. Indeed, dates continue to be given in plus/minus year notation, leaving a lot of room for differences of opinion and varied interpretations. Moreover, when megaliths of stone are chronologically dated, calibrated radiocarbon dating relies on INDIRECT evidence obtained from nearby biological environments, e.g. wood ashes from neighboring ancient hearths, which provide data that reflect fragile constructs perhaps best be described as "educated approximations". For example, wood ashes from a prehistoric nearby campfire may have been made by the megalith builders in their era, or not at all by them, but by other folks -- even in a different unrelated era. You can't just assume that the ancient hearth ash that you have found stems from the megalith makers. We analyzed Paulsson's cal BC dates using regional location-specific averages of the maximum and minimum date extremes, which reduces the magnitude of the size of the dating spread. 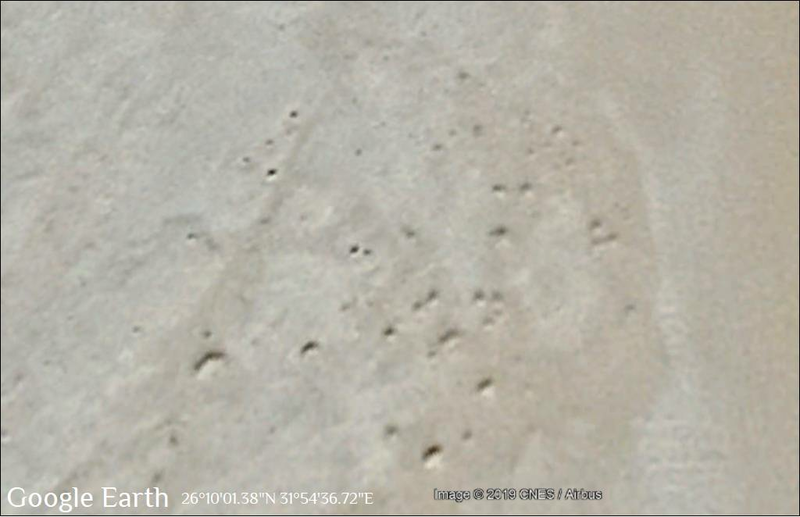 This method in fact leads to geographically proximate dates that appear to be virtually contemporaneous in time, as we have already shown in our prelude posting. Paulsson's article also -- if unavoidably for a mainstream academic -- integrates mainstream archaeologcial megalithic conclusions of fact that beg the main questions of the nature and meaning of ancient megaliths and megalithic sites. (2) that megaliths were "spread" over time by so-called "cultural diffusion", rather than being built in relatively concurrent eras of construction for a common purpose having nothing to do with cultural technology transfer as such. As we have long alleged, it is our opinion -- and it is an alternative explanation that must be examined by serious researchers -- that megalithic sites were never originally tombs as such, nor were they "spread" by "cultural diffusion" in the sense of the general geographic spread of pottery. Rather, we allege that megalithic sites were intentionally erected in a massive more-or-less immovable magnitude of scale at fixed locations and more-or-less concurrent times, to act as landmarks sited by astronomy and to function for calendric calculation and recordation of important astronomical parameters, especially Precession of the Equinoxes based on the Earth's "Axial Precession". Most prehistoric megalithic sites -- in our opinion -- serve to landmark astronomical viz. calendric eras or locations. That is why the ancients undertook the otherwise unnecessary and logistically difficult transport of gigantic multi-ton megaliths over immense distances, for ultimate more-or-less "immovable" placement at previously selected "sites", where "standing stones", stone circles, dolmens, tumuli, and similar were "sited" by astronomy and left for posterity as geographic landmarks, territorial border stones and calendric calculating markers. Similarly, we allege that any new later "wave" of megalithic construction is separated by hundreds of years from the previous wave of construction and reflects changes in the astronomical landscape as caused by precession of the equinoxes, as caused by the cycle of the wobble of the earth in its rotation. One such main cycle that we see in the megalithic data is ca. 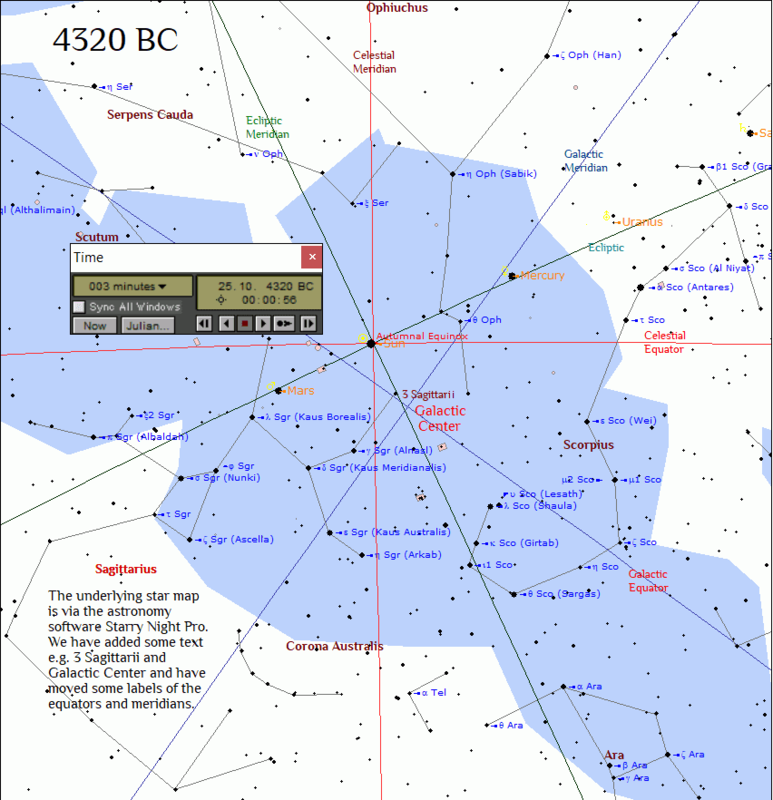 1440 years (= 20 cycles of 72 years) which is close to the Dynastic Egyptian "Sothic Cycle" of 1460 years, which the Egyptians allegedly tied to their observations of the position of the star Sirius in the sky. 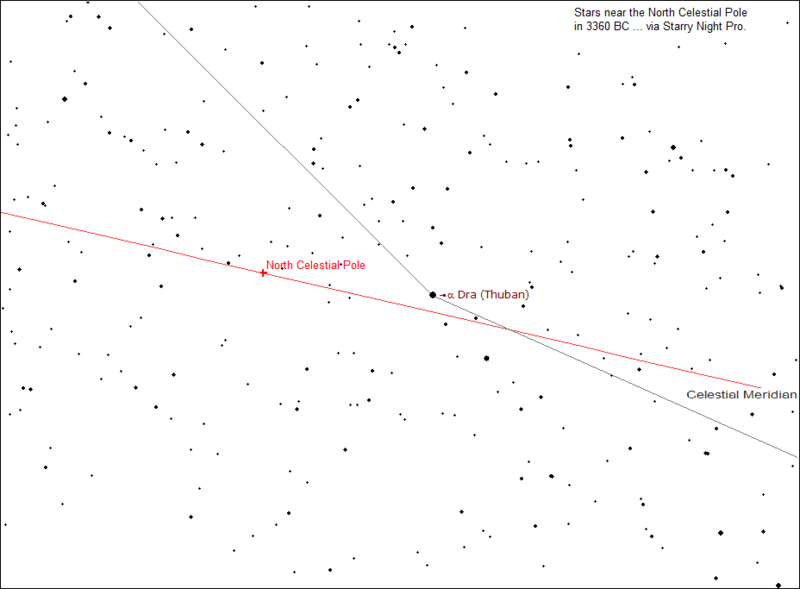 However, the Sothic Year need not be seen as unique to Sirius. The entire heaven of stars for any given day of the year returns to the same position on the same day of the year in approximately 1440 viz. 1460 years, depending on the calendration used. Moderns place one full round of precession at 25920 years, whereas the ancients seem to have used a figure of 25800 years. Precession moves star positions 1 degree every 72 years. This apparent movement of the stars over long periods of time permits star-based calendration. Hence, 360 such periods of 72 years equals 25920 years, the anciently calculated period of one full round of precession of the stars in the sky, which is visible as the gradual and constant change of the position of the Celestial North Pole Star. 12960 years ago (i.e. one half of the full precessional "round" of 25920 years), the celestial North Pole Star was located near Vega in Lyra. To obtain knowledge of such phenomena, prehistoric stargazers must already have been watching the stars for many millennia prior to the megalithic era. For details, see Jim Wakefield and Precession of the Equinox. 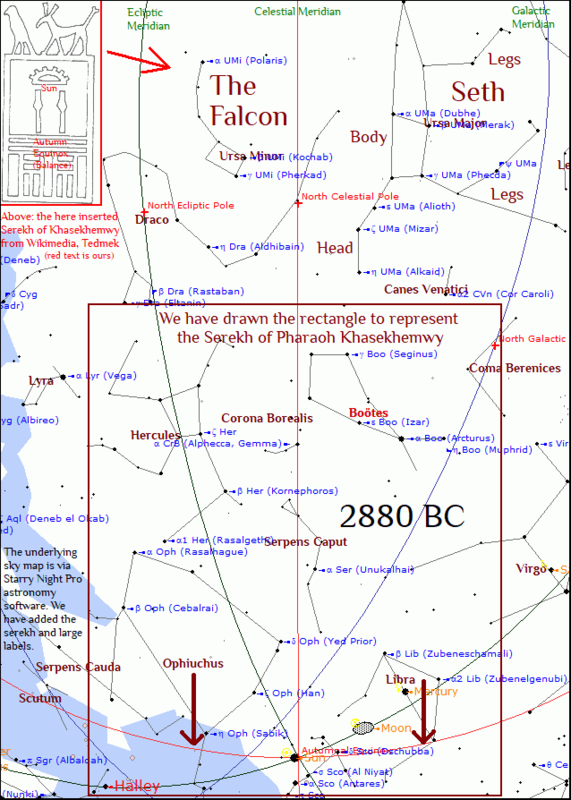 We think the ancients used precessionally-based "star" knowledge to keep track of time in the stars over longer eras, and we have previously tried to explain how this was done in the case of Pharaoh Khasekhemwy (Chasechemui) at our posting on Khasekhemwy and Pharaonic Calendar Reform in 2638 BC, where we claim that a 120-day calendric reform was made in the 480th year after 479 elapsed years of dynastic pharaonic Egypt (the elapsed years are represented as vanquished enemies at the foot of Khasekhemy's statue) -- based on a then posited starting date of 3117 BC, i.e. ca. 240 years after 3360 BC. Our research suggests that the astronomical time formula used by the ancients involved 54 such cycles of 480 years viz. 108 such cycles of 240 years = 25920 years. The elapse of 480 years (rather than the use of e.g. 360 years) was arguably used by the Pharaohs because, just as we modernly insert a leap year every four years, the elapse of 480 years corresponded to a "leap year" correction of 120 calendric days, i.e. 4 months of 30 days in the annual Egyptian Civil Calender. The early Pharaonic Egyptians used a calendar of only 3 seasons at that time -- seasons that were guided by the flooding of the Nile -- so that 480 years was an ideal period for calendric reform, corresponding to an adjustment of 120 days in the 3-season civil calender -- thus once more bringing actual seasons and the civil calender into proper astronomical and seasonal sync. 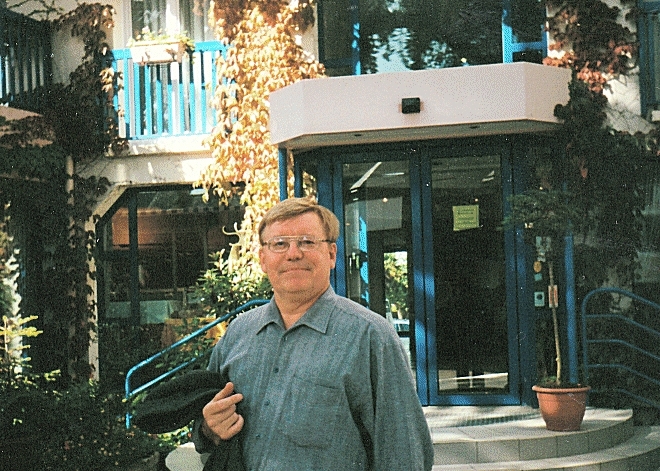 Let us now ask a question about the calibrated radiocarbon dating of the megalithic data that Paulsson has published. Was calendar reform at the root of the megalithic era's astronomical measurement of the 480-year cycle (or in some cases perhaps a 240-year cycle) based on axial precession in the stars? Is that what is shown in Paulsson's data? Let us start -- for the sake of argument -- with a starting calendar date of 4320 BC which is 3 x 1440 years (some will claim we should use 1460 years) of stars returning exactly to the same position in the sky on the same calendric date. Prelude to Our Review of "The radiocarbon dating of megalithic sites, Bettina Schulz Paulsson: PNAS, Radiocarbon dates and Bayesian modeling support maritime diffusion model for megaliths in Europe"
The radiocarbon dating of megalithic sites has been analyzed in a recent article published at PNAS (Proceedings of the National Academy of Sciences of the United States of America) by Bettina Schulz Paulsson titled Radiocarbon dates and Bayesian modeling support maritime diffusion model for megaliths in Europe. PNAS published ahead of print February 11, 2019 https://doi.org/10.1073/pnas.1813268116. We are very sympathetic to Paulsson's approach on the megaliths and on the idea of the maritime spread of megalithic "culture" as it were by ancient seafarers. It is in our judgment an important work, but there are also some points of disagreement viz. suggestions for future, expanded analysis. This posting is a short prelude to our detailed posting which follows next. We have taken Paulsson's map of the basic calibrated radiocarbon data of megalithic sites in Europe, reducing and simplifying the underlying data by taking "averages" of regional dates to see if they reveal anything of importance. There is in fact a regular "clustering" of data at 480-year intervals. Below is our "averaged" data of Paulsson's map data dating. Although 4400 BC would be a better fit to the first set of averages, we use the date of 4320 BC, as later explained, to be the cardinal date for the first megalithic surge viz. "wave" of megalith building, with such surges or waves separated by the elapse of a 480-year period. We discuss the why of that in the next posting. The above are pretty much the main dates, so why are the megalithic surges or "waves" separated by a series of 480-year intervals? die krankhafte Geschwätzigkeit der Karnevalskommentatoren. Eine für den Fernsehzuschauern Wahl-Tonspur ohne Kommentatoren ist angesagt. Da wollte man die Faschingsumzüge im Fernsehen geniessen und "miterleben", und die gespielte Musik und Sounds mithören, zusammen mit den "Live-Highlights" der Feierlichkeiten. Da wird stattdessen "das Erlebnis" bzw. "das Ereignis", d.h. der Faschingsumzug als "Live-Entertainment" als solches im Hintergrund gestellt, und die lauten "unerträglichen" vortragsähnlichen Kommentare mit überlauter Toneinstellung im Vordergrund gestellt. Wer will diesen Quatsch hören? 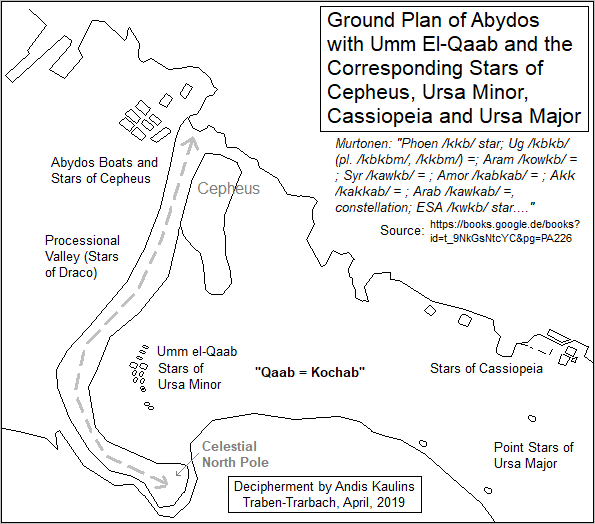 We have a new decipherment -- the Abydos Boats and Enclosures, which we have found to mark the stars of Cepheus, as follows in the graphic below. 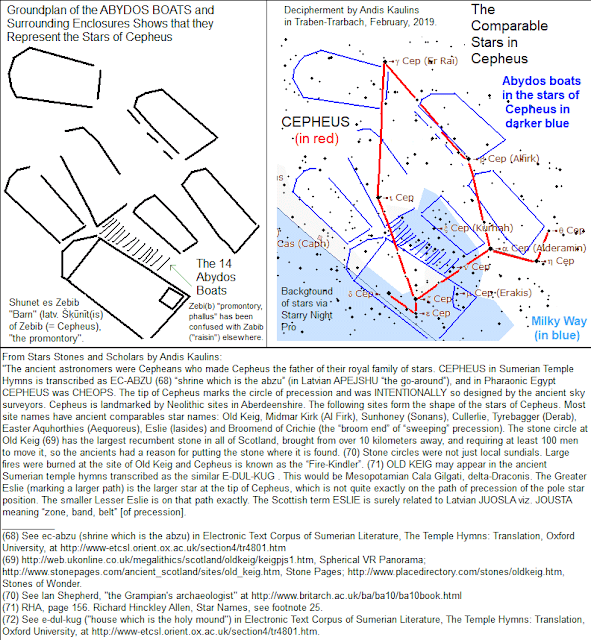 By tradition, Cepheus is regarded to have been one of the Argonauts -- Minyans who "went out to measure" the Earth via astronomy in a pioneer seafaring voyage, by our calculations, ca. 5000 years ago. Were these the maritime boats by which Jason and the Argonauts conducted their mission? Perhaps. For background, it might prove useful for the reader to read our past posting Ancient Seafaring, Megaliths, Egypt, Phoenicia, Carthage and the Periplus of Hanno (and for an inkling of what is to come in our forthcoming postings on a PNAS article just published by Bettina Schulz Paulsson, Radiocarbon dates and Bayesian modeling support maritime diffusion model for megaliths in Europe). Click on the image to obtain a larger image for a better reading of the text. Enjoy. published today in the New York Times (February 22, 2019). than most anything else found written or said in daily news reports or opinions. Many would have us believe that the world turns on politics or religion. Not so.